WizSmart – a dog pad that really works, so you don’t have to. 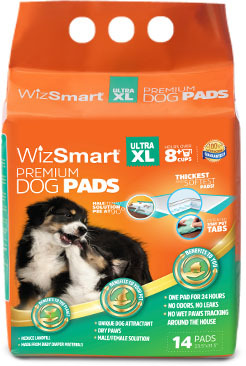 WizSmart Super Absorbent Dog Pads absorb more—up to 8 cups a day. You get convenience and peace of mind, while your best friend gets the confidence and comfort of healthy and clean indoor living. It dries quickly, so no messy tracking in the home. It won’t leak, so forget spills and smells. It stays put, and thanks to a one-of-kind attractant formula, your dog always knows where to find it. WizSmart pads work every time and over-time for when you’re out, but your four-legged friend has just got to go! A one-of-a-kind formula and exclusive blend of materials come together for superior absorption and quick drying and last for 24 hours. No muss, no fuss thanks to special sealed edges that stop leaks to keep paws dry, free from tracking and your home clean. WizSmart quickly absorbs liquids to better trap and eliminate unpleasant aromas. Forget frustration—patented “Stay Put Tabs" do just that so the pad remains exactly where you left it, and will get used more often and correctly. Since boy and girl dogs eliminate pee a bit differently, we’ve got him covered! Our Stay Put tabs let you place the pad at a 90-degree angle to protect both wall and floor. Train your pet with a unique and safe fragrance formula that’s irresistible to dogs so they know just where to go. We transform more than 120 million unused diapers each year into a super absorbent blend for our pads. They get a new life and stay out of the landfills, which is great for your pet and your planet! Don’t take our word for it, see the proof! Watch how WizSmart soaks up the competition! Happiness is sharing a clean & healthy home with your best friend. More than 300 million pads sold and nearly 200,000 well-trained and confident pets living in comfortable indoor spaces add up to lots of happy dogs. Isn’t that what being a pet parent is all about? Find out what WizSmart Super Absorbent Dog Pads by Petix can do for you and your best friend! 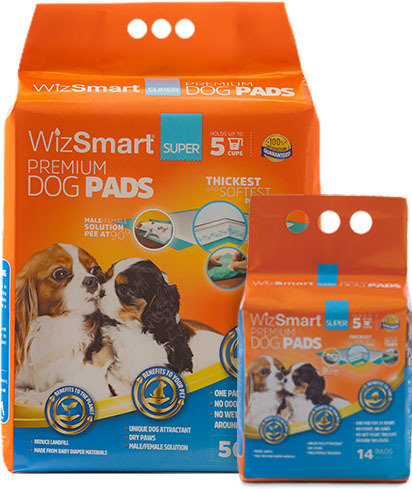 As the market leader in Brazil, the second largest pet market in the world, we’re so sure of WizSmart pads’ quality, we back them up with a 100% satisfaction guarantee.